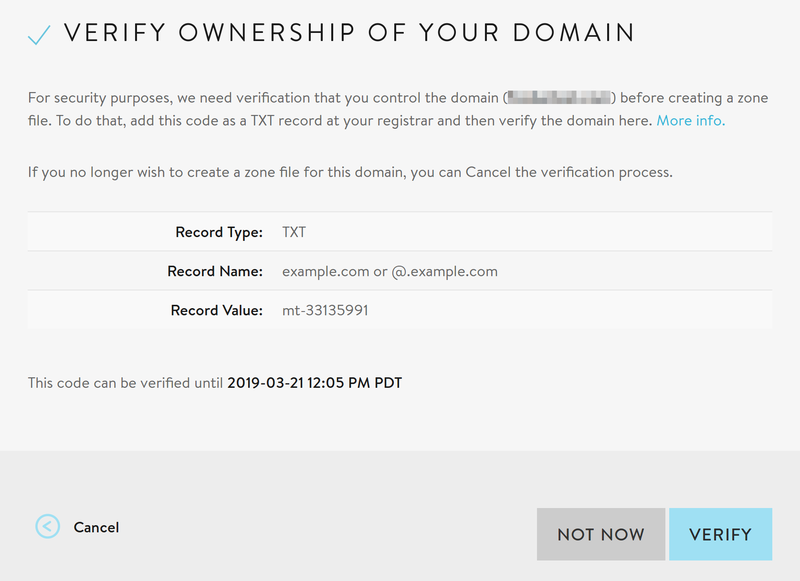 You will also want to make sure you have access to your domain's registrar account (the place where you registered your domain name) as you may need to edit your domain's nameservers during this process. If you don't have an account yet, click on Sign Up and create an account for Cloudflare. Enter the name of your domain. Then click Add site. In this example we are using "mt-website.com." Be sure to replace this with your actual domain name. A message should appear informing you that CloudFlare is querying your DNS. Click Next to continue. 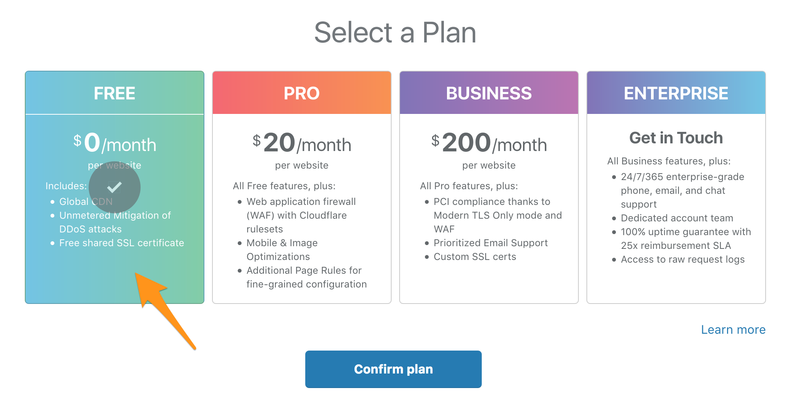 Select the Free plan. Then click Confirm Plan. Ensure once more the Free plan was selected. Then click Confirm. In our case, we needed to verify a domain at Media Temple, so we changed the type to TXT, inputted our root domain name, then pointed it to our Record Value (mt-33135991). Then click Add Record. 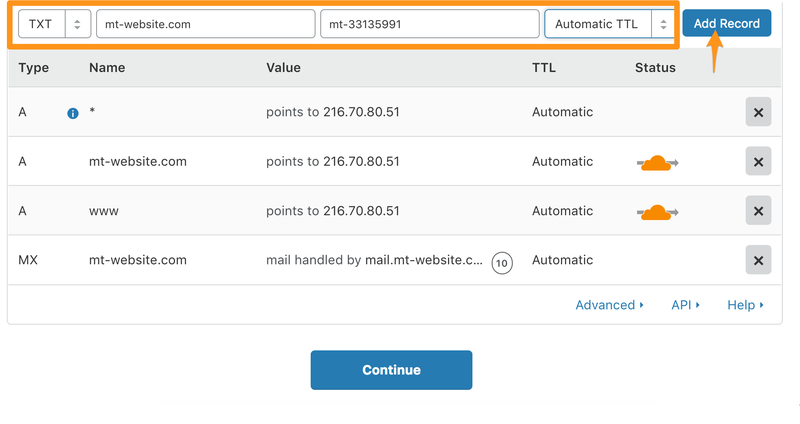 Some DNS from our old host was automtically copied for us by Cloudflare. But no need to worry if you don't have any records from the start, or if your records look different from our example. If you added any records, they should now appear in the list to confirm they were created successfully. Then click Continue. 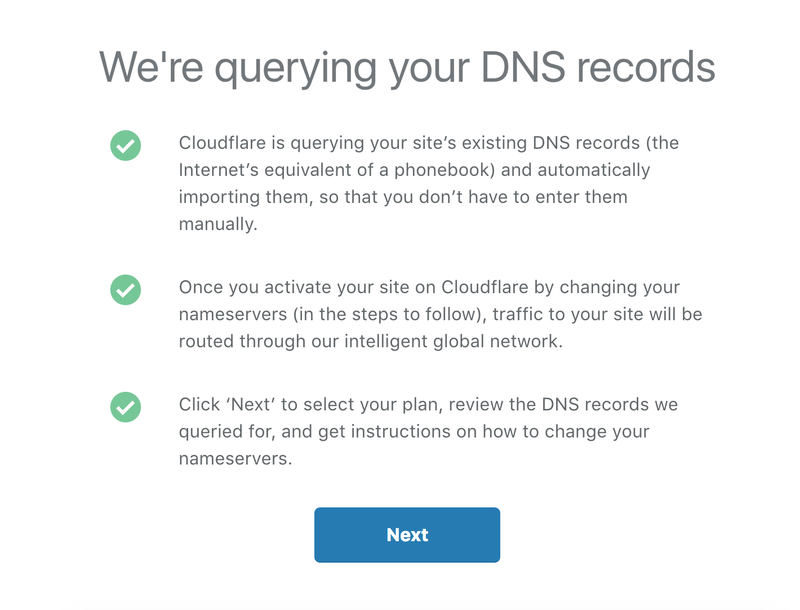 Cloudflare may prompt a message to change your nameservers. To do this you will copy the nameservers provided, and use them to replace your old nameservers. 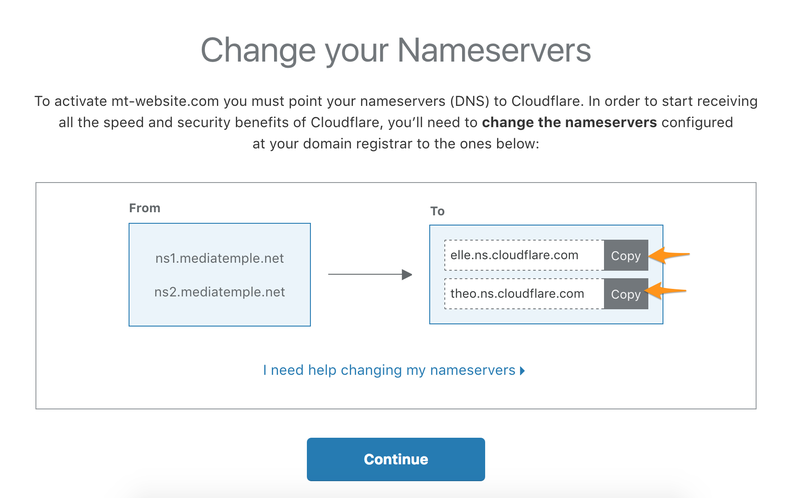 If you are unsure how to change your nameserver, Cloudflare provides additional instructions for some of the popular domain registrars. Once you have the nameserver information you require, you can click Continue even if you haven't changed the nameservers yet. 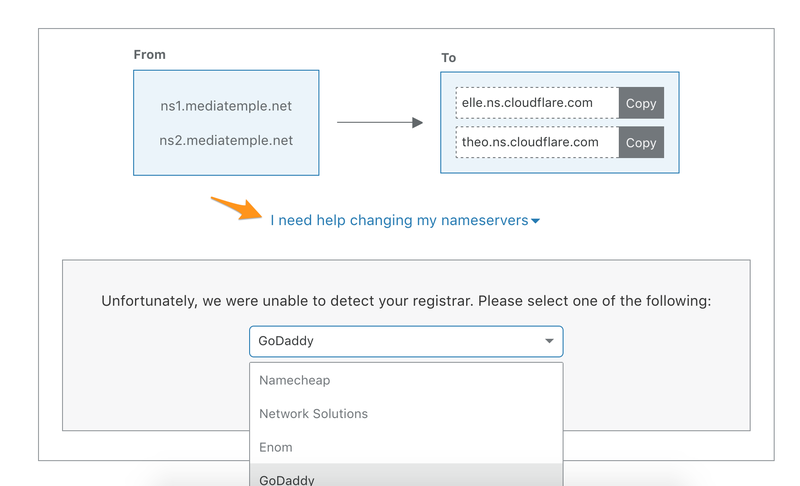 If you still require assistance in changing your nameservers, then you may want to contact your domain registrar directly for assistance. Once you've changed your nameserver at your registrar, the change can take some time to propagate (up to 24-48 hours). 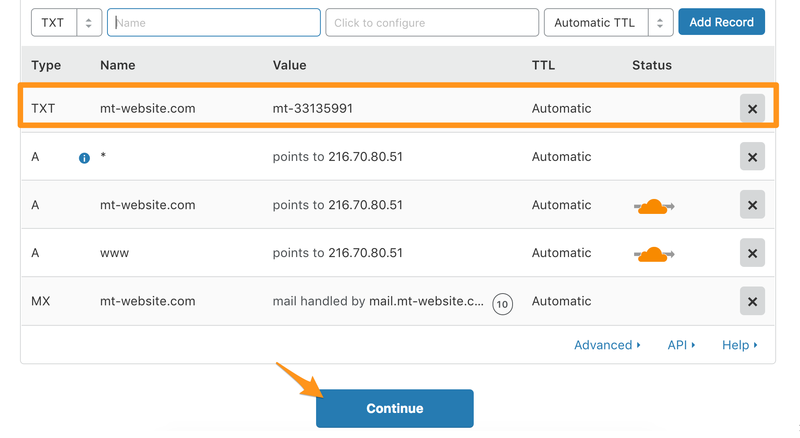 However, you can periodically click Re-check now and Cloudflare will rescan the nameservers. Once the nameservers propagate, you should see a confirmation message. That's it! Your domain's DNS should now be hosted for free at a third-party host. 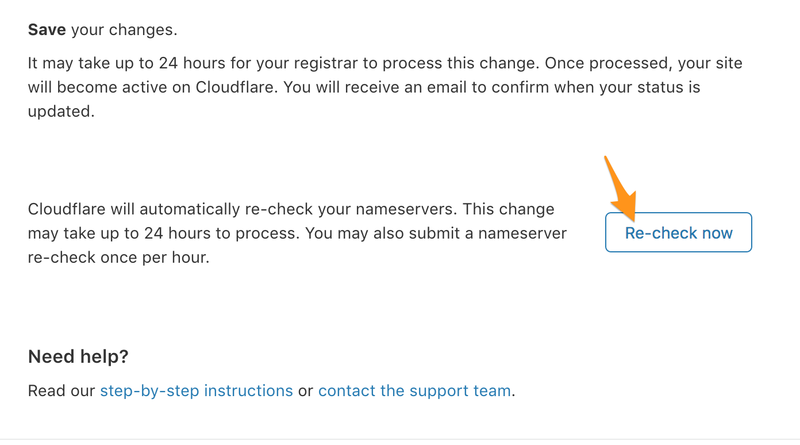 If you require further assistance on Cloudflare or changing nameservers at a third-party registrar, you may want to contact Cloudflare Support or your the support of your third-party registrar directly.